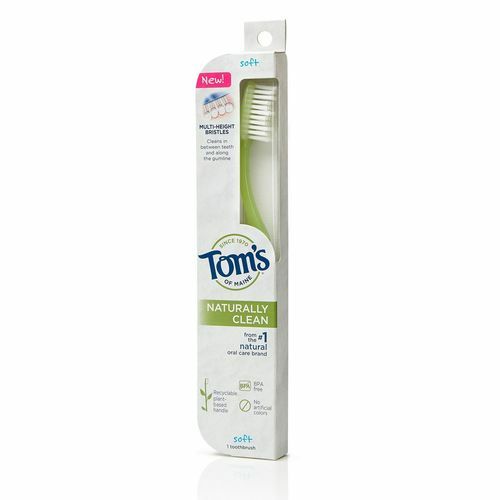 Make a healthy change to your dental hygiene habits by using Naturally Clean Toothbrush from Tom's of Maine. This BPA-free toothbrush is plant based, recyclable and environmentally friendly. Naturally Clean Toothbrush from Tom's of Maine is designed to effectively reach between teeth and along the gumline for a total cleansing in your mouth. Don't forget to brush twice a day! Naturally Clean Toothbrush from Tom's of Maine can help you achieve a brilliantly healthy smile with its super effective teeth-cleaning properties. Get yours today at eVitamins for a great price! Notes: Directions: Dentists and hygienists recommend replacing your toothbrush at least every 3 months. The customer reviews posted below are based on individual consumer experiences and may NOT necessarily represent what expected results will be from using or taking Tom's of Maine Naturally Clean Toothbrush Medium - 1 Toothbrush. These results may not be typical and you should not necessarily expect to receive the same results. Actual results may vary. I love you. My teeth feel cleaner than expected with this.